An ABSOLUTELY elegant Tarragona on a premium GOLF course LOT w/quality accents throughout. 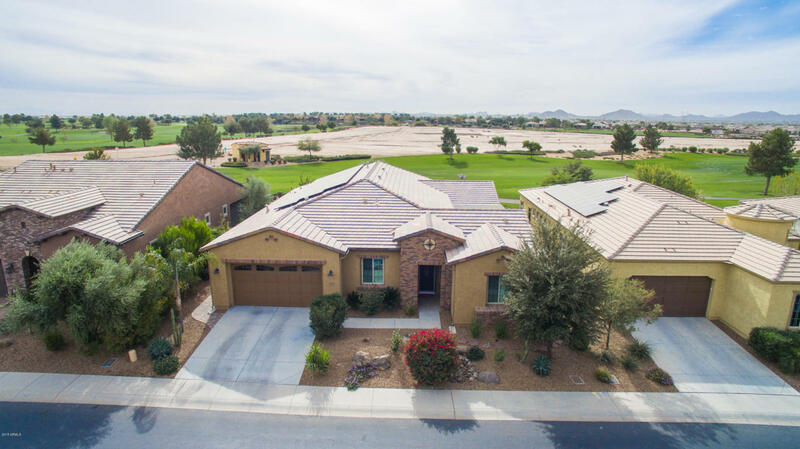 Everything that can be upgraded is in this stunning 2668 sq ft home, w/FULL Solar (20 year prepaid lease), 2 BDRS + den, 2.5 baths & an extended library like smart space. Wood flooring that leads to Gourmet kitchen w/SS Appliances, incl. wine fridge, stunning granite counters & detailed back splash. Expanded Smart Room acts as studio/office - loads of cabinets, counters, storage & laundry. Master offers 2 built out closets, large bath w/granite counters separate tub & shower, floor to ceiling tiles. Details abound - side courtyard w/pergola privacy wall & firepit, rear yard overlooking golf course & built in amenities 2nd to none. This could not be built new for at least $200K more at todays costs! !